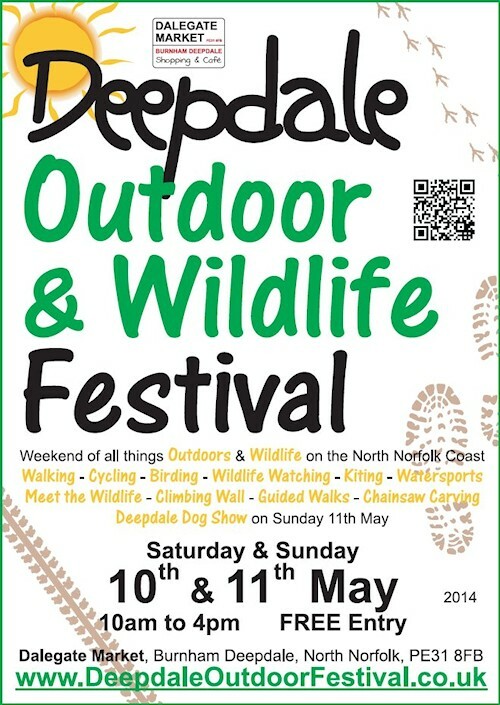 ... for a weekend all about the outdoors and wildlife of the beautiful North Norfolk Coast – Deepdale Outdoor & Wildlife Festival 2014. Burnham Deepdale is already the perfect base for a visit to the North Norfolk Coast, with its camping, self catering accommodation, glamping, café and shops. Match those facilities with an excellent bus service, busy harbour, great beaches, wide open skies, countryside, the Norfolk Coast Path and many local walks and cycle routes, then you have heaven for those who love the outdoors and wildlife. Why not celebrate all that is great about this beautiful part of the world – We give you the Deepdale Outdoor & Wildlife Festival. Visitors are welcome throughout the weekend, to wander the stands and try out some of the activities. There’s a free Climbing Wall, Nordic Walking taster sessions, Bungee Trampolines and Bushcraft Skills throughout the weekend. You can also Meet the Wildlife with the Seal & Bird Rescue Trust, allow an owl to perch on your arm or a snake to coil around your body. This year we have two Chainsaw Carvers, Paul Kelly and Carrie Yuen, who will be creating amazing statues from lumps of wood before your eyes. On Saturday, Active Norfolk are running Archery taster sessions throughout the day, a chance to try this Olympic sport. On Sunday, Solemates Norfolk Walks will be running a Guided Circular Walk. The highlight of the event for our four legged friends is the Deepdale Dog Show, which also takes place on Sunday. The event is open to all comers, competing for Prettiest Girl, Handsomest Boy and Film Star pooches, amongst other categories. Entry fees will help raise funds for PACT Animal Sanctuary. This year’s Deepdale Outdoor & Wildlife Festival coincides with the Brancaster Staithe Sailing Club Push The Boat Out event on the afternoon of Saturday 10th May, an open event for anyone who’d like to try sailing. The perfect weekend combination, a sailing taster and a visit to the Deepdale Outdoor & Wildlife Festival, why not add a stay in a yurt or tipi at Deepdale Backpackers & Camping. Naturally the Dalegate Market shops will be open throughout the weekend - The One Stop Nature Shop, The Hare & The Hen, Fat Face to name a few, plus the newly refurbished Deepdale Café. They will be joined by more than 30 stands including Outdoor Antics, RSPB, Hawk & Owl Trust, Girlguiding Norfolk, Home Grown Revolution, Norfolk Wildlife Trust, Pebbles Photography, TheCanoeMan and Westfield Forge. Many more will be added to the event between now and May. Full details of the Deepdale Outdoor & Wildlife Festival can be found online at: www.deepdaleoutdoorfestival.co.uk – The programme of events, activities and stands will grow right up until the event. It’s not too late for stands to apply, they should visit the website for details.